Aosta Valley in Italy has several medieval palace treasures. One of them is Fenis castle, known as Castle Aosta. It is located in the town Fenis and is a typical example of medieval Italian works. Its massive architecture of major battle walls and numerous towers are in relatively good condition. It became one of the most interesting tourist attractions in this part of Italy. The complex structure of the castle Fenis was actually for fighting a medieval fortress, which was built concentrically around the inner courtyard. The original fort Aosta mentioned in historical documents in 1242 when the building was simplified, surrounded by protective walls. The mansion was feud of the local family Challant, who were lords of Aosta. 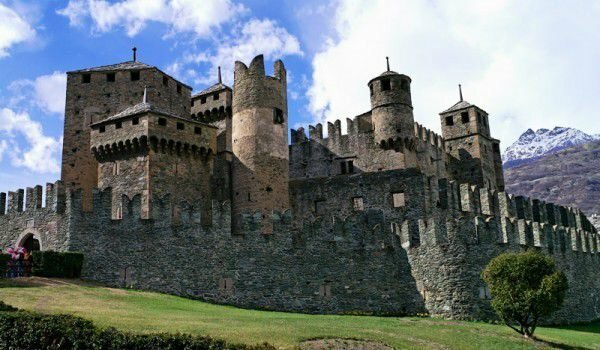 In the form in which today we see the castle Aosta, it was built between 1320 to 1420, when Aimone Chalant and his son Bonifacio took possession of their reconstruction. In 1392 Bonifacio begins the second phase of "refining" the castle Aosta, with staircases and terraces built in the courtyard and the premises used for the prison. The massive defensive towers appeared in the early 15th century. In the inner courtyard of the palace a chapel was built, which was painted with beautiful murals of the Italian master Giacomo Jaqueiro. At the time of Bonifacie, castle Aosta reached its biggest rise. Then fortification took place with lawns, gardens and vineyards, where the lords of the castle and their guests were attributable to noisy celebrations. Aosta remains in possession of the family Chalant until 1716 when the then heir to the fortress was forced to sell to cover debts. After this period the castle Aosta is neglected and became a refuge agriculture, barn, etc. In 1895 architect Alfredo Di Andrade bought the palace and began a major restoration campaign for the damaged structures. Today the castle Aosta is owned by the regional community and turned into an interesting museum with genuine medieval furniture.